Winter holidays = peppermint. And my winter holidays aren’t complete without a tray of cookies. On that tray, I like a big variety that offers several flavors, including peppermint. This peppermint sugar cookie recipe is the same vintage sugar cookie featured here. I’ve tweaked the recipe to make it a good choice for all the Christmas cookie baking I know you guys have planned. This is a crunchy cookie with a bit of chew and just a hint of peppermint. A roll in red sanding sugar makes it stand out on a tray of Christmas goodies. Use any colored sanding sugar you’d like. If you’d like to amp up the peppermint flavor of these cookies, crush up a handful of candy canes or peppermint candies in your food processor. 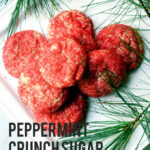 Add the crushed peppermint to the dough and/or sprinkle on top of each cookie before baking. Even your most devoted elf might pass up these cookies if you’re careless with the peppermint extract. One teensy drop too much will turn peppermint cookies into minty fresh mouthwash cookies. To be sure you only add 1/2 tsp peppermint extract, measure the extract away from the bowl–over your counter top or a measuring cup so you don’t accidentally wobble and spill too much peppermint in the dough. Really, measuring extract away from the mixing bowl is good baking practice. But, I get lazy and often measure vanilla extract over the bowl. Does anyone remember that Baby Bash song from 2003? 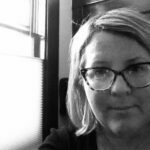 I thought it would be a good intro to talk about sanding sugar. Sanding sugar has larger crystals than the granulated sugar you might be in five pound bags at the grocery store. Sanding sugar comes in a zillion different colors. But if you can’t find the color you want, you can make your pretty easily or so I’m told. Also, sanding sugar has a bit of sparkle because it reflects light. Sanding sugar gives your cookies, like these sugar cookies or gingersnap cookies more crunch. Sanding sugar also gives your cookies a polished look. Where to buy sanding sugar? Craft stores like Joann’s or Michael’s. Kitchen supply stores like Williams Sonoma or Sur la Table. Specialty baking stores and sometimes at candy stores. A hint of peppermint extract and red sanding sugar makes a vintage sugar cookie recipe extra festive for the holidays. Use any colored sanding sugar you'd like. 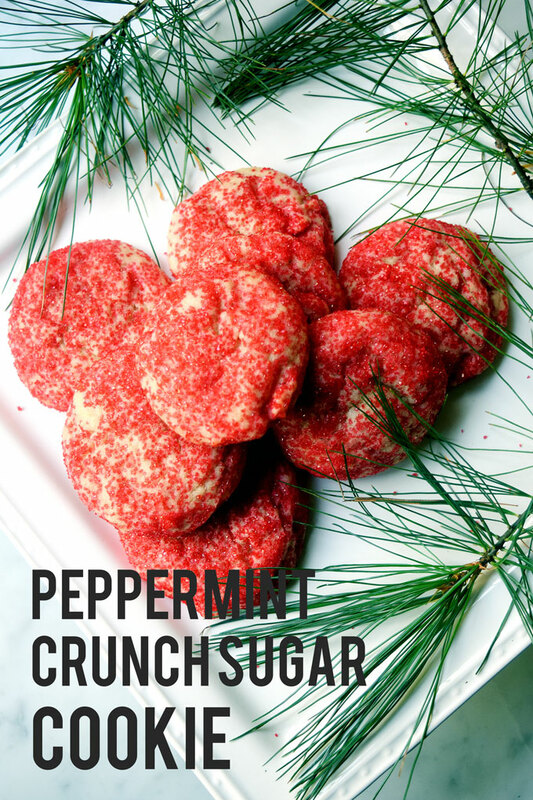 If you'd like to amp up the peppermint flavor, crush up a handful of candy canes or peppermint candies in your food processor and either add to the dough and/or sprinkle on top of each cookie before baking. Add peppermint extract and egg and beat for another minute until combined. Tell me what you’re planning to bake for the holidays? What cookie recipe can I find for you?